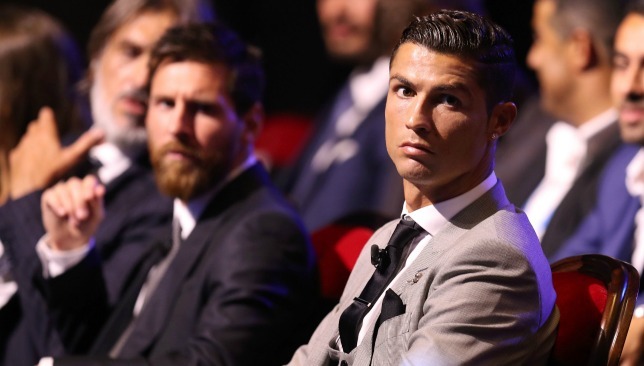 Ronaldo and Messi pictured recently at the Champions League draw in Monaco. Al Sadd star Xavi feels former team-mate Lionel Messi is still the best player in the world, but Cristiano Ronaldo does usurp the little genius in at least one department. While both players boast unbelievable goalscoring records – with Ronaldo having scored 407 goals in 396 appearances for Los Blancos in all competitions and Messi having netted 510 times in 587 matches in a Blaugrana shirt, Xavi suggests the Portuguese holds a slight edge on Barca’s historic No.10. In an interview with Marca, Xavi admitted that Ronaldo is the better of the two when it comes to shooting at goal, when positioned in the chief No.9 role. The 37-year-old said: “Ronaldo is [the best] as a shooter, he’s incredible at that and is a historic player. But with Messi you cannot compare. The Qatar-based star also denied suggestions that Messi – a long-term friend of the midfielder’s – had delayed signing his new contract extension due to Barcelona’s supposed lack of summer transfer activity (before the arrival of Ousmane Dembele). Girona centre-back Bernardo (c) in action against Antoine Griezmann. Girona, you could say, is the city that has it all. Located 45 minutes south of the French border and an hour north of Barcelona, it boasts a magnificently preserved medieval centre, crammed with narrow, winding alleyways which are blessed with an abundance of world-class restaurants. A few miles to the east lie the beautiful rocky beaches of the Costa Brava, attracting millions of visitors every year, while a similar short distance to the north-west brings you to the glistening peaks and ski resorts of the Pyrenees mountain range. Until now, however, one thing that Girona always lacked was a top-class football team, with the city’s barely-supported club occupying an anonymous place in the lower leagues and contesting local Catalan competitions against similarly small-time outfits such as Olot and Banyoles. But that has all changed with a dramatic transformation over the past decade, firstly taking the team into the Segunda Division after a wait of half a century and this season, following a handful of potentially devastating near misses, a place in the top flight for the first time in club history. Journalist Carles Rosell has spent the last nine years covering the club’s fortunes for local newspaper Diari de Girona, and he describes the recent upturn as “an incredible change. There has been a trio of key figures behind that turnaround: club president (and former player) Delfi Geli, director of football Quique Carcel and manager Pablo Machin, who have worked together for the last three years. Another major factor in the club’s progression has been a close association with Manchester City, with a steady supply of young players making their way from Etihad Stadium to north-eastern Spain for loan spells. City’s chief executive Ferran Soriano and director of football Txiki Begiristain possess close and long-standing connections with Girona since their time at nearby Barcelona. Last week Girona’s alliance with City was made much stronger with the news that the club has become the latest member of the English giant’s international stable. City Football Group are now 44 per cent joint owners of the Blanquivermell alongside Girona Football Group, which happens to be headed by none other than Pere Guardiola – the younger brother and agent of City boss Pep. As a sign of things to come, five young City players are spending the season on loan at Girona, who had the temerity to beat their parent club 1-0 in a recent friendly. From now onwards that will become a consistent occurrence, allowing City to get around the lack of competitive reserve team football in England – something which infuriates Guardiola – by sending their most promising young stars to sharpen their skills at a high level in Spain. There is, however, no guarantee that City’s young stars will get into the team. Only one of the five loanees, 20 year-old right-back Pablo Maffeo, was named in the starting line-up for the team’s opening two games of the season, which resulted in a thrilling 2-2 draw with Atletico Madrid and Saturday’s fully deserved 1-0 win over Malaga. Despite welcoming a dozen new arrivals this summer, Machin has been loyal to the core of the team which gained promotion. Lining up in an attacking 3-4-3 formation they persist with passing football, regularly switching the play to utilise dangerous wingers Borja Garcia and Portu, and Saturday’s confident performance against Malaga showed they have clearly found a formula which works. The final whistle, confirming Girona’s first-ever top flight victory, was met with unrestrained celebrations by the players and fans alike, even though there were still a few empty seats in their council-owned Montilivi stadium which has been adorned with additional seating this season to take the capacity beyond 13,000. Rosell admits it feels “very strange” to see so many people inside Montilivi after spending the last nine years following the team in the company of no more than 2-3,000 spectators, but gradually the fanbase is growing. This is a club of recently converted locals rather than long-term die-hards, and historically football fans in Girona would support a top flight team – generally Barcelona, with busloads habitually making their way south to Camp Nou. 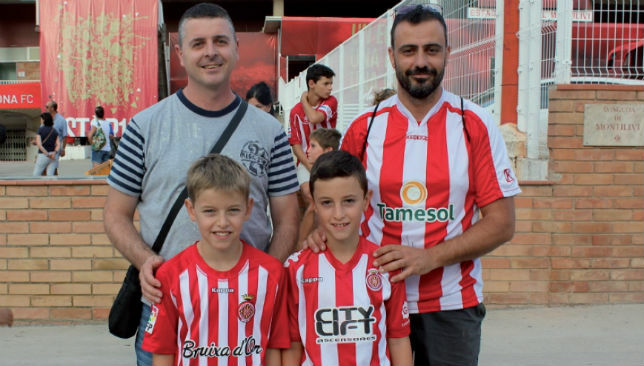 Typical of the rising Girona fanbase are Jaume Boix and Jordi Lafuente, season tickets holders with their respective sons Marti (8) and Biel (10). They first started following the team “three or four years ago,” and Biel revealed there has been a notable shift in allegiances among his schoolmates. “Lots of my friends were Barca fans,” he said. 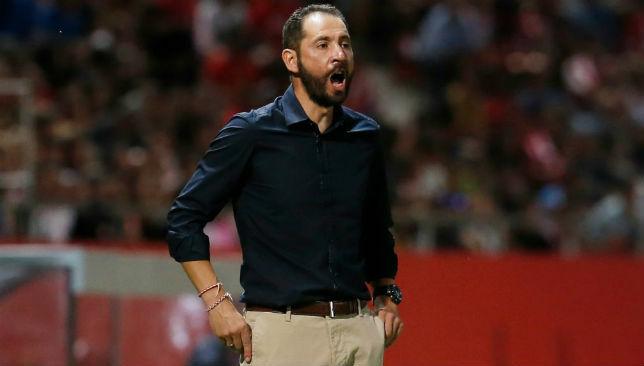 “But now more of them support Girona.” Predictably, manager Machin is attempting to ensure his players do not get carried away with their recent successes. One of Machin’s brightest assets is impressive 24 year-old midfielder Pere Pons, who was born in Girona, progressed through the club’s youth ranks and is now forming an effective top-flight partnership with canny captain – and another local boy – Alex Granell. So, how far can they go? Rosell is setting the bar high, pointing to the example of Villarreal’s rise in the last couple of decades. “They are another team from a small town who do things well and look at what they have achieved, reaching the semi-finals of the Champions League,” he said. With a strong core and friends in high places, you never know. 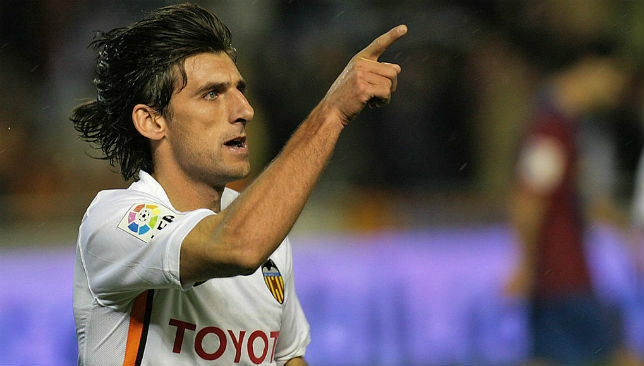 Despite their recent troubles Valencia have traditionally played a supporting role to LaLiga giants Real Madrid and Barcelona. Atletico Madrid and Sevilla are the modern challengers to the El Clasico pair, but Los Che have managed to upset the established order many times, most effectively when they won the title in 2002 and 2004. 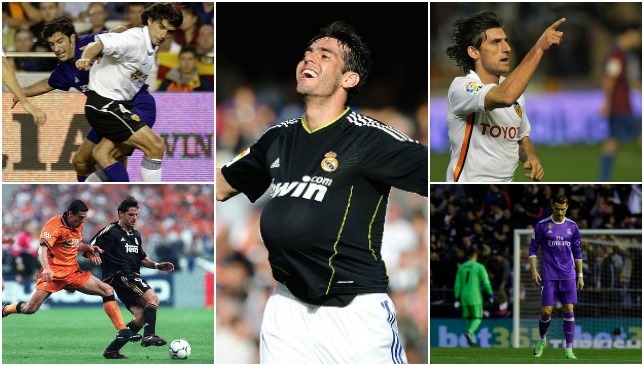 Here’s a look at some of the most memorable duels between Real and Valencia ahead of Sunday’s league clash in Madrid. 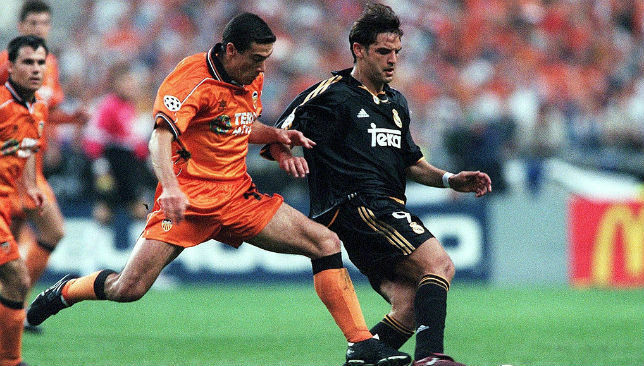 A Valencia team inspired by the likes of Spain star Gaizka Mendieta had stunned Europe to reach the Champions League final, but they would suffer a gruelling evening at the Stade de France. In the first European Cup final to be contested by two clubs from the same nation, Real dominated their compatriots with a Fernando Morientes header, Steve McManaman’s volley and a late Raul third sending Los Che packing. Valencia fired an early warning to Real, and to the league, that they meant business by beating the defending champions 1-0 on the first day of the season. 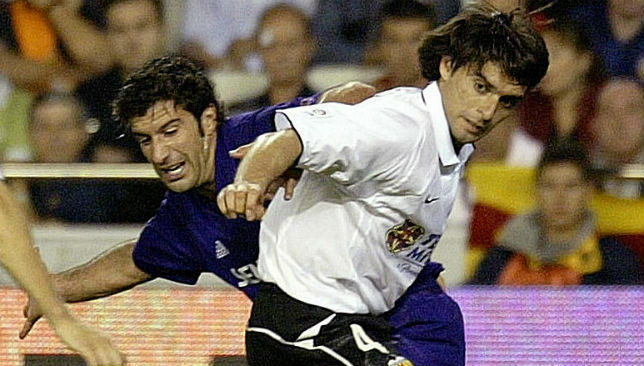 Portuguese star Luis Figo was sent off at the Mestalla, late in a game which had seen Los Blancos struggling to respond to Miguel Angulo’s early opener. In the previous May, Valencia had managed to win the league for the first time since 1971 but come the end of the next campaign they had fallen from grace. Real had battled Real Sociedad all season long to reclaim the crown and a brace from Ronaldo at the Mestalla, with a reply in between by Fabiano Aurelio, confirmed the capital-city club as the frontrunners. They went on to clinch a 29th championship but boss Vicente del Bosque was surprisingly sacked. This nine-goal thriller had no effect on the ultimate destination of the title, which went to Pep Guardiola’s Barcelona, but it was one of the games of the season. Gonzalo Higuain was never better in the Real shirt as the Argentinian hitman plundered a hat-trick in Valencia, after Karim Benzema had broken the deadlock. Real were grateful for Kaka’s double as Los Che launched a second-half comeback which saw Roberto Soldado, Jonas and Jordi Alba notch. Real thought they might live to regret this defeat at the Mestalla, as it denied them the chance to pull clear of improving Barca, who drew level with them at the top as a consequence. Simone Zaza had recently moved to Spain following a low-key spell with West Ham and he hit the ground running with an early opener, and Fabian Orellana had Voro’s men two goals to the good before 10 minutes were up. 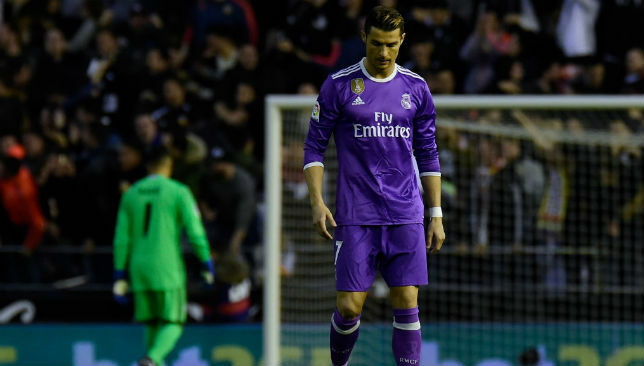 Cristiano Ronaldo hit back but it was not enough to protect a six-game unbeaten run. Luckily for Real, they would go on to beat Barca to the title.